The Easter Bunny will be available to meet with families from 10:00 a.m. to 8:00 p.m. on Mondays through Saturdays and 11:00 a.m. to 7:00 p.m. on Sundays. 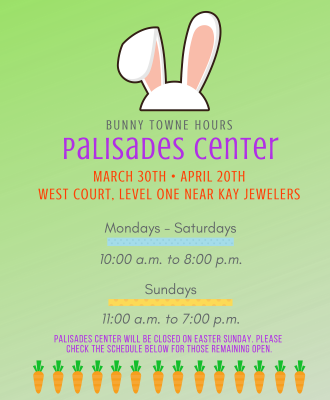 Palisades Center will be closed on Easter Sunday, however please check the list below for those remaining open! For updates, please follow Palisades Center on Facebook and join our event page. Check out our dedicated Bunny Towne blog for more events and additional deals! In addition, families are also eligible to register for Bunny Fastpass! Beat the lines during a designated time slot to meet with the Easter Bunny! Service fees apply.